Offering you a complete choice of products which include acrylic number plates, car number plates, aluminium car number plates, fancy number plates, embossed number plates and engraving number plates. We are an eminent organization, which is engaged in manufacturing, supplying and buying a comprehensive array of Acrylic Number Plates. Our expert professionals manufacture the offered array of acrylic number plates in compliance with the industry laid standards. Further, to meet the exact requirements of the patrons, we customize these acrylic number plates as per their detailed specifications. With the sincere commitment of quality, our organization is manufacturing, supplying and buying a wide array of high-grade Car Number Plates. 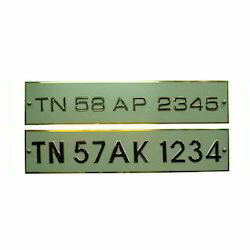 These number plates can be used in various vehicles such as truck, tempo, car, bus, and scooter. This is a rectangular shape number plate, which bears a sequence of numbers & letters issued by the government. 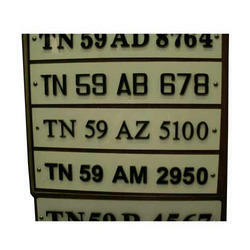 We are offering these fancy number plates in various design, shapes, and texture. Backed by a vast experience in this industry, we are manufacturing, supplying and buying a qualitative array of Aluminium Car Number Plates. 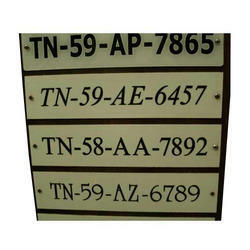 Offered array of plates are available with us in various sizes of numbers and alphabets. 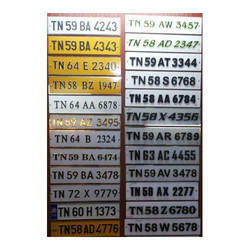 Further, we customize offered number plates as per the specifications detailed by the patrons. Our customers can avail these number plates at affordable prices. Our organization is supported by a safe & sound infrastructure facility, which aids us in offering superior quality Fancy Number Plates. 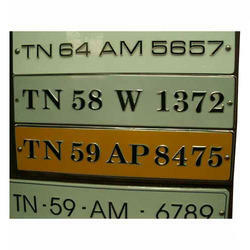 We design & develop offered array of fancy number plates keeping in mind clients specific requirements. Further, we design these fancy number plates in customized forms. These plates are manufactured using 3 mm aluminum composite panel. Being a customer-focused organization, which is engaged in manufacturing, supplying and buying a wide array of Embossed Number Plates. With the help of our adroit team of professionals, we are manufacturing, supplying and buying superior-grade Engraving Number Plates. Manufactured using 3 mm acrylic sheets, these number plates are engraved 1 mm depth using CNC Machines. 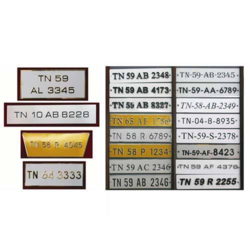 The offered range of engraving number plates are available with us in various designs, colors and sizes.